For the past 4 years, I've been wearing a Fitbit device of some sort. I started with the One, which stuck with me for the better part of 3 years, then I tried the Blaze, the Alta, and the Charge 2. My main complaint with each of these trackers was the lack of water-resistance, which meant that I couldn't wear them in the pool or track my swims with them. 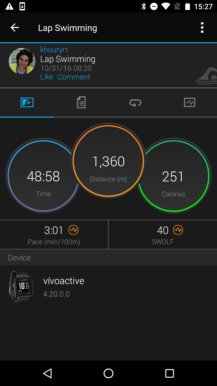 I've tried several swim trackers including the Misfit Shine 2 Swim Edition and Amiigo, looking for something that could replace Fitbit, but the best that I found was the Garmin vivoactive, which has excellent swim tracking and can send the main stats to Fitbit through MyFitnessPal. It's not an elegant solution, but it worked for me for the past year or so. 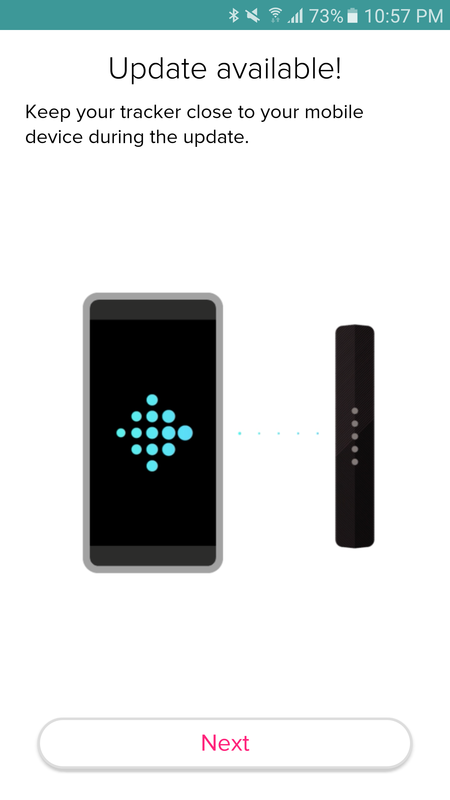 So you can imagine my joy — better yet, you can read it — when Fitbit announced the Flex 2 with water-resistance and swim tracking. At last, I wouldn't have to go through workarounds to get all of my swims to show up in the Fitbit app, and I could keep it on in the shower and the pool without worrying about it. 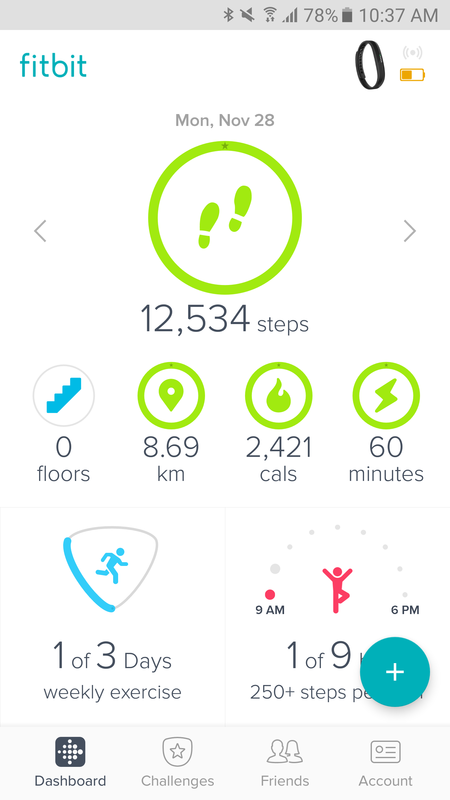 I've been wearing the Fitbit Flex 2 for the past month or so, and using it exclusively for over two weeks. The result is a little mitigated. Several compromises had to be made with the Flex 2, and that's understandable but only to a certain point. 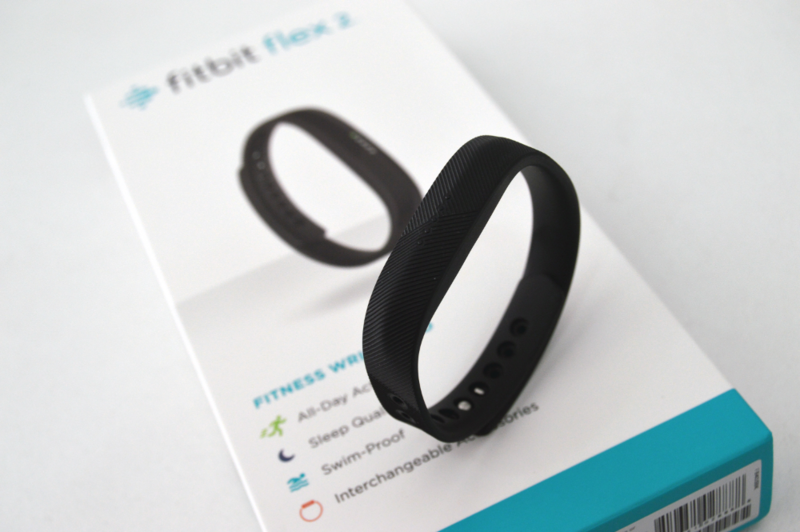 The Flex line is one of the most basic Fitbit models, so you expect it not to come anywhere near the capability of the Alta, Charge, or Blaze line, but in some respects, the Flex 2 even feels like a step back from my 4 year-old Fitbit One, which is slightly disheartening. Tiny and light The new Flex 2 tracker is so small and light that I can barely feel it on my wrist. Band The band's clasp is solid and never even one popped off or came close to it. 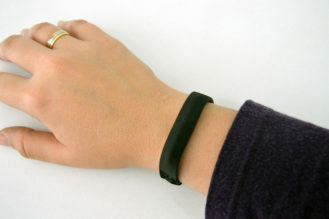 The band is also removable so you can buy new colors, a bangle or even a pendant. 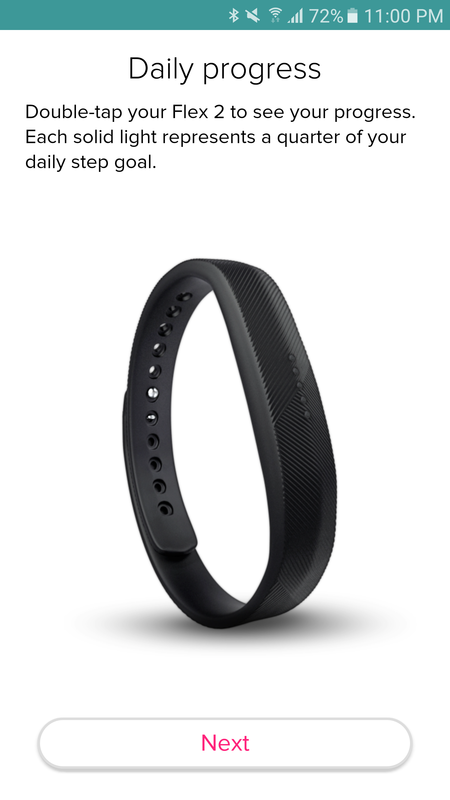 Oh and the Flex 2 ships with a regular and a large band in the box - no more worrying about which size works best for you. 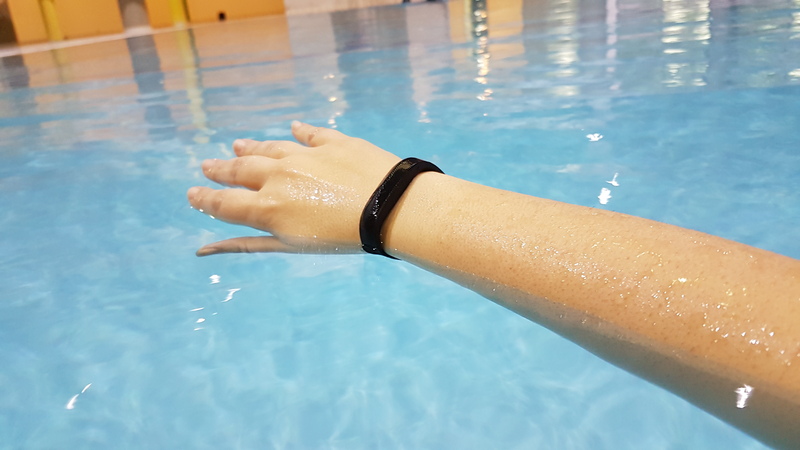 Water resistance and swim tracking The Flex 2 is shower-friendly and water-resistant up to 50m. 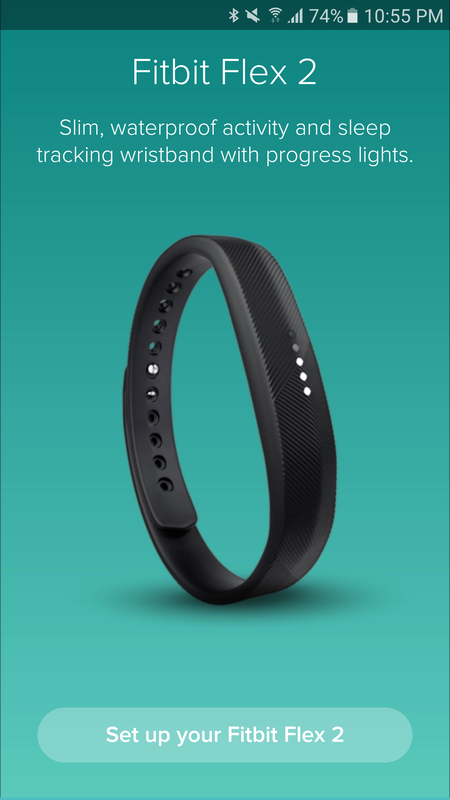 This is the first Fitbit to have that rating. 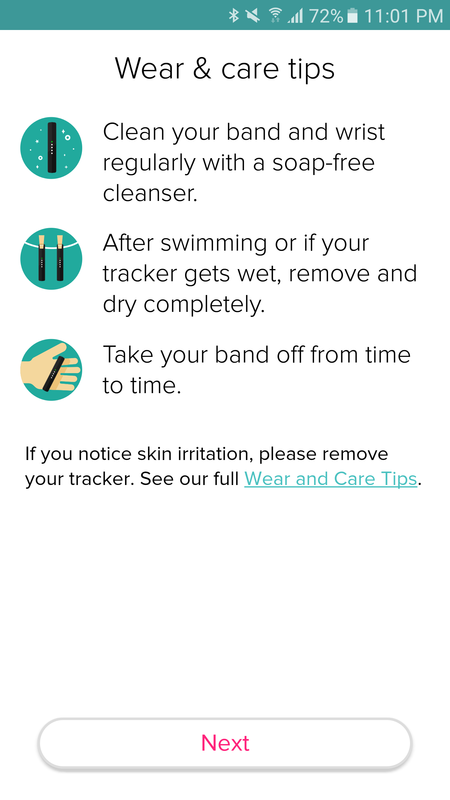 And swim tracking is automatic without fiddling with your phone or tracker. 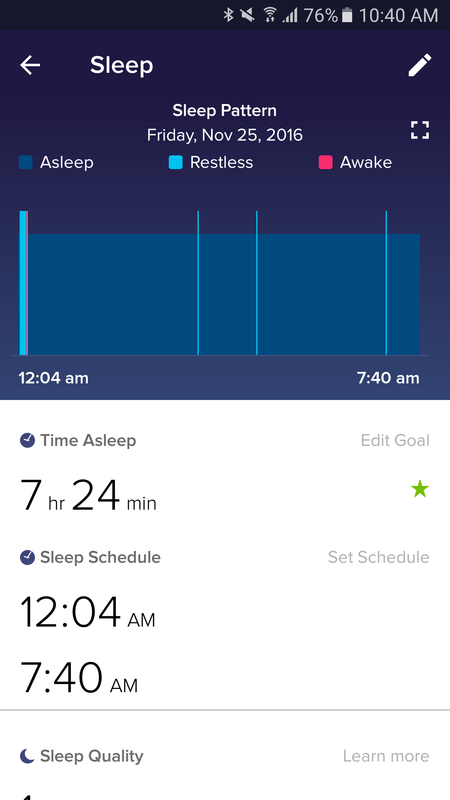 Automatic sleep tracking and exercise recognition Like all recent Fitbits, the Flex 2 can automatically log sleep, recognize which exercise you were doing, and track it. Even swims. 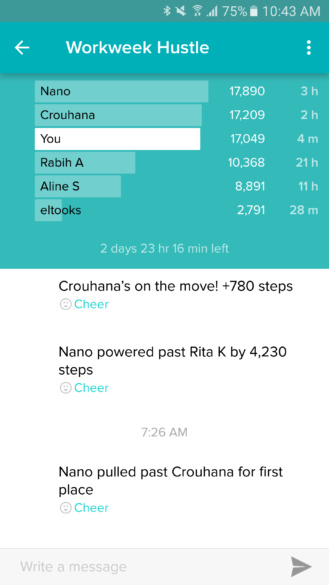 Reminders to move It's one of the cheapest Fitbit trackers that can vibrate to remind you to get off the chair. Better tracking with your phone The Flex 2 doesn't have GPS built-in, but it can use your phone to launch a manual exercise log with GPS route tracking. 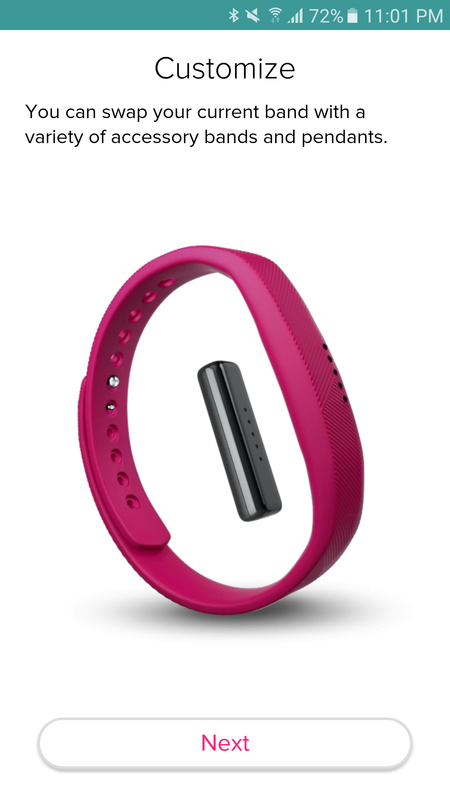 No official clip Fitbit doesn't sell an official clip for the Flex 2. I'd love to wear it on my pants or bra, because I often walk without moving my hands (treadmill, holding phone/tablet, hand in pocket...). No stairs tracking There's no altimeter in the Flex 2 so it can't track how many floors you've climbed. 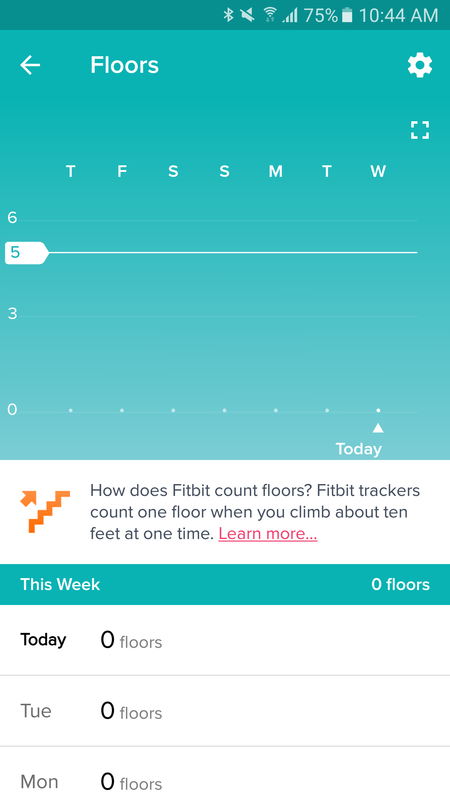 Even the Fitbit One can track flights of stairs. LED lights instead of display The LED lights are adequate, but there's no way to tell the time, see the exact number of steps, or get proper notifications through them. 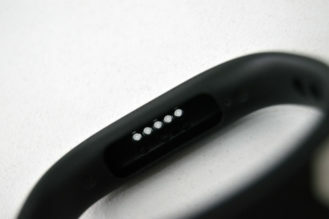 Another proprietary cable Yet again, Fitbit decides to create a new charging cable design that no other tracker uses. 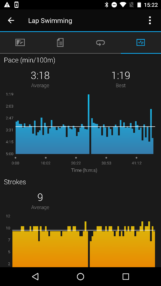 Swim stats No stroke or speed stats, no interval recognition, no SWOLF score, the current swim stats are based on calorie expenditure and very basic compared to what other trackers provide. Price At $99, the Flex 2 feels a bit overpriced given the lack of a real display and altimeter. $79 would have been more realistic. 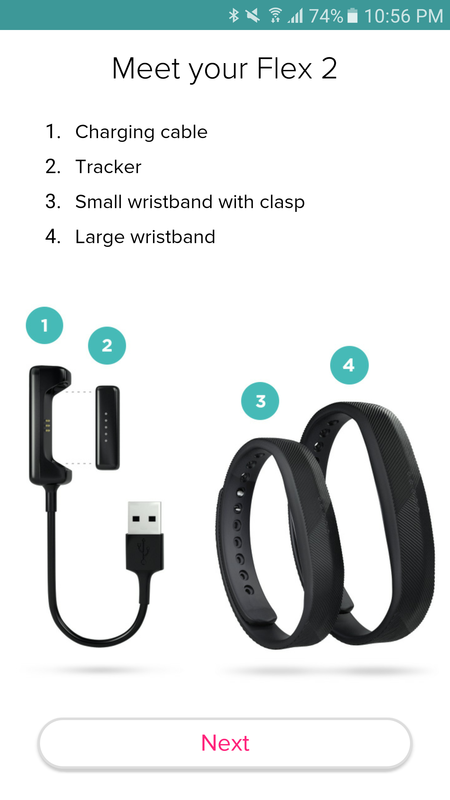 The Flex 2 ships in Fitbit's signature box with the tracker, two bands to fit regular and large wrist sizes, and the charging cable. 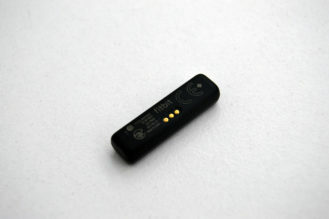 The Flex 2 tracker is so small and light that the first time you see it, you'll probably be very surprised. There isn't much to its design: the front is a glossy black that hides the 5 LED lights and the back has the regulatory certifications and charging pins. 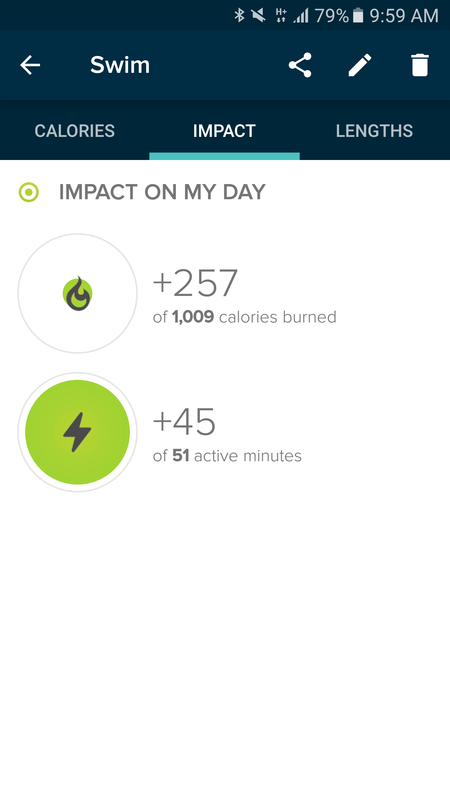 The front is also touch sensitive: you double tap it to see how far along you are in your daily goal. 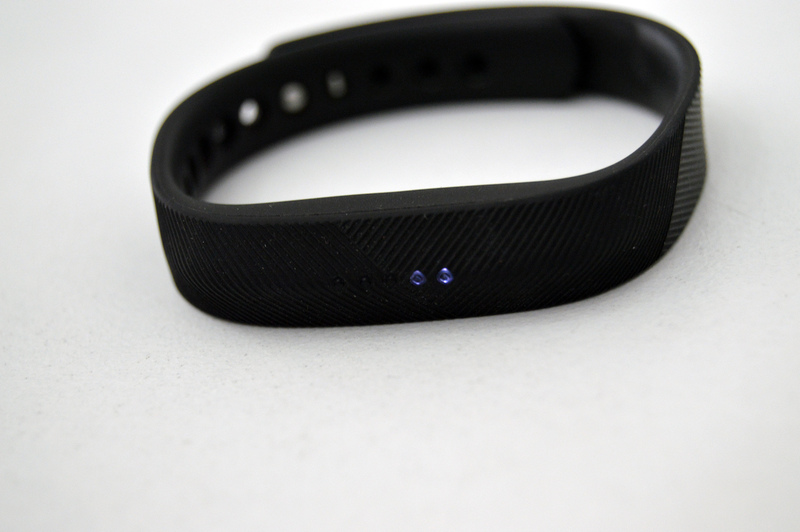 The 4 white LEDs light up to tell you when you've reached 25, 50, 75, and 100% of your goal. The Flex 2 has a very simple, sort of understated design. If you're wondering how small the tracker is, think of a regular paper clip. That's it pretty much, but thicker. 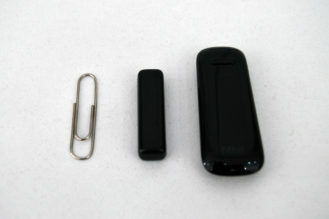 The below image with it next to the paper clip and the older Fitbit One tracker should explain my point. It's also very light. At 0.83oz (23.5 grams), you are very unlikely to even feel it on your wrist. From the first hour I wore it, I forgot it was there. And beside feeling inconspicuous, it also looks the part. As far as other people are concerned, this could pretty much be any regular black wrist band, not an activity tracker. So small, so thin, so light. It almost doesn't exist on my wrist. The band has an opening on the bottom to slide the tracker in and transparent plastic holes corresponding with its LED lights. So when the tracker is in, you can still see the different colors. Those 5 transparent plastics (left) are where the tracker's LED lights shine from (right). 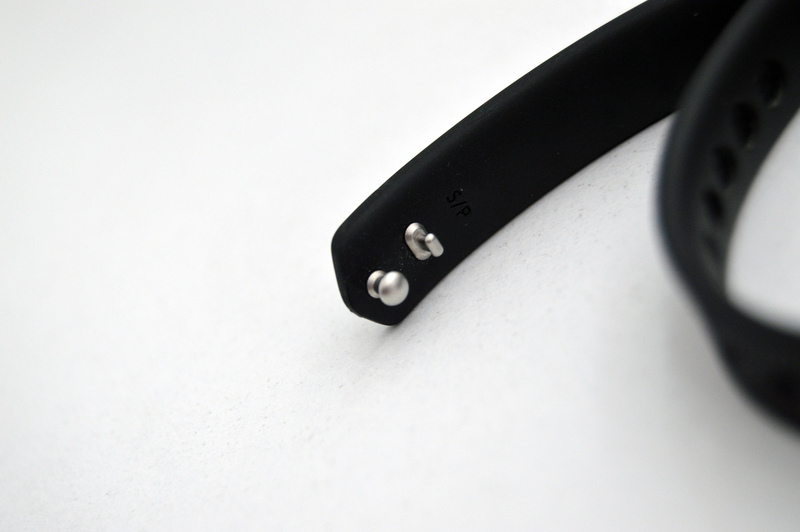 For a band with no clasp, I have to say that the Flex 2 has a surprisingly solid closing mechanism. The pins push into the holes with a very satisfying click and never ever in the past month did they give me any worry that they could pop off. Compared to the Flex 2 and original Fitbit Charge, this is a big improvement. Even the Misfit Shine 2 had tendencies to catch on things, unclasp, and get loose, and that band had a loop to help it hook better! The Flex 2 only has these 2 pins but they work so, so well; part of it is probably due to the different shapes of the pins. And even after a month, despite pushing them in the same holes on the band, they still hold perfectly. 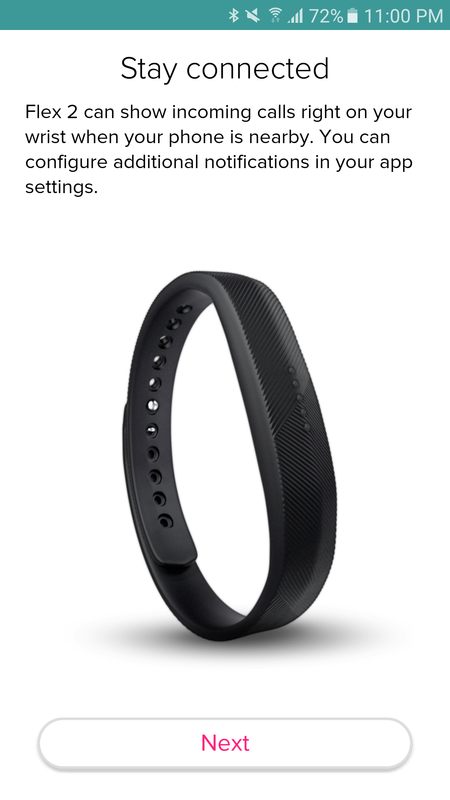 Kudos on nailing the design, Fitbit team. Despite only using two pins, the band holds perfectly in place without a risk of popping off. 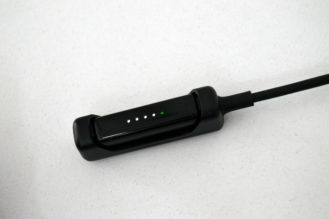 The Flex 2 charging cable is a little cradle where you slide in the tracker after removing it from the band. You'll have to align the pins to the correct side, otherwise you might lose a couple of hours with no juice flowing to your device. 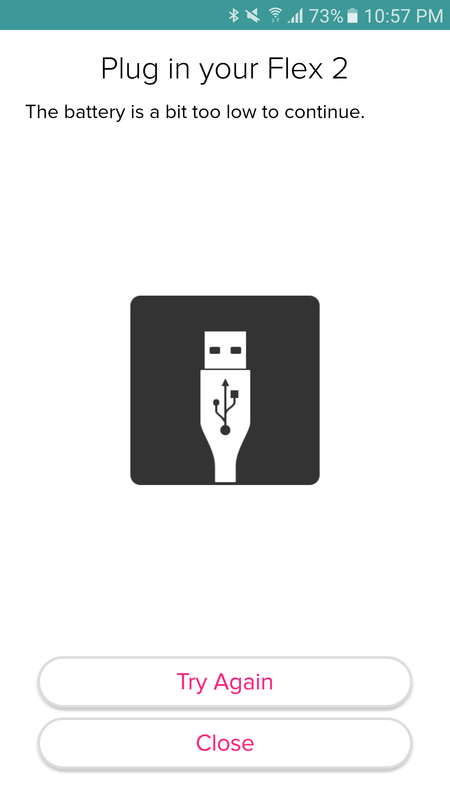 But aside from this little quibble, the charging cable is probably one of my favorite designs from Fitbit. It's less delicate than the Alta and Charge 2's cables and simpler than the Blaze's charger. 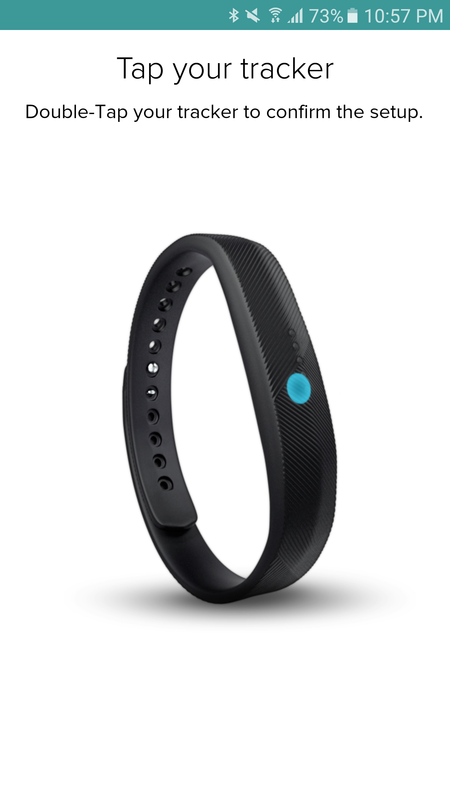 It's still proprietary though and no other Fitbit tracker uses the same design. Sigh. 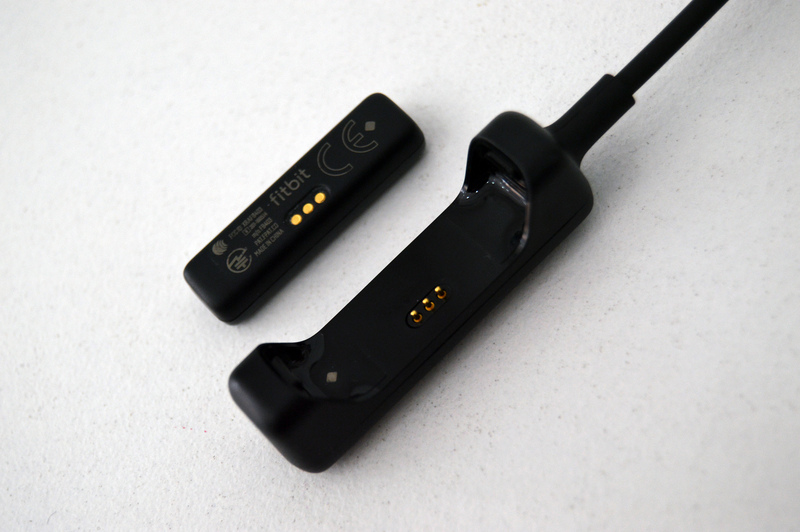 Align the tracker and charger pins (left) to charge completely (right). Check those 5 LED lights too. One of the defining features of the Flex 2 is that it's water-resistant up to 50m. So you can shower and swim with it, without breaking it. I've taken it into a 3m deep pool several times and showered with it more times than I can remember. It's still functioning perfectly. Finally, no more worrying about removing my Fitbit each time my hands hit the water for more than a few seconds. 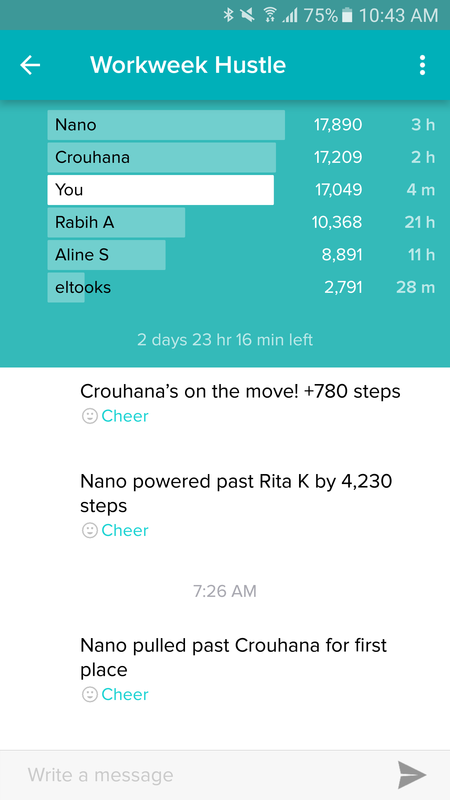 Adding the Flex 2 to the Fitbit app is pretty much the same experience as any other tracker. You choose it among the list, add it, check for an update, plug it in to finish installing the new firmware, and you're done. Here are the different steps. 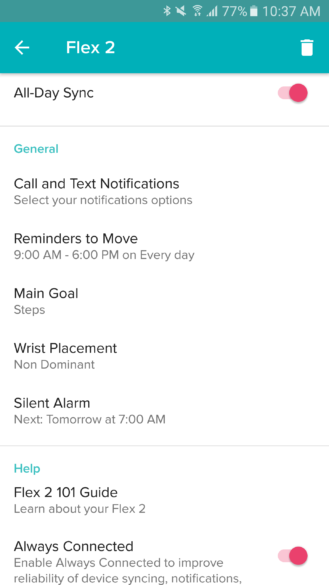 Before you're taken to the app's main page, you get a short tutorial about your Flex 2, which explains how to check your progress, set up notification and alarm alerts, replace the band, care for your band and tracker, and where to wear the band for optimal tracking all day and during exercise. 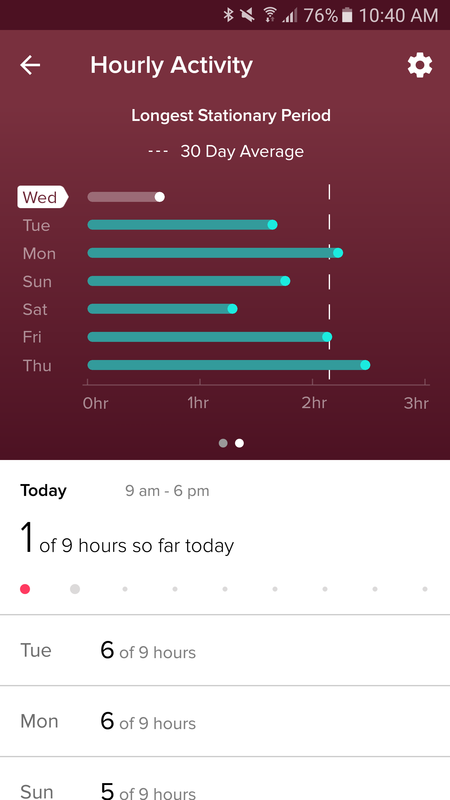 The main Fitbit app now has a preview of the new Dashboard design which shows you more of your stats on one screen. You can see your steps, distance, calories, active minutes, floors, and more at a glance. 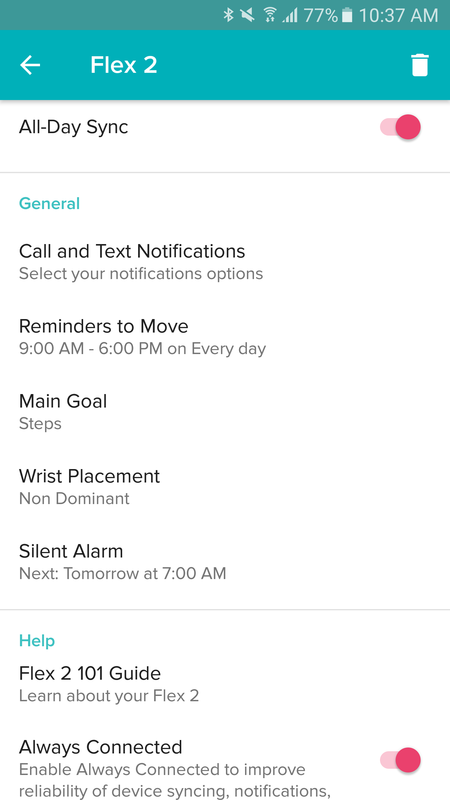 Tapping the tracker icon on the top right reveals all the Flex 2 settings that you can modify, including reminders to move, main goal, preferred wrist placement, and silent alarms. 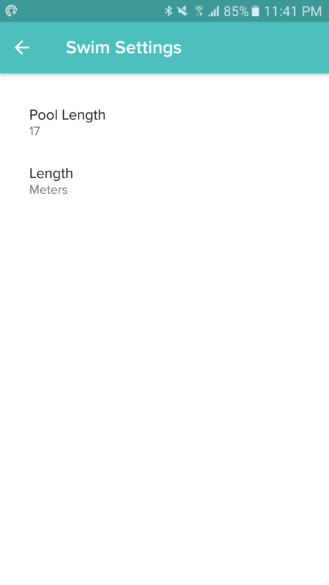 This is also where you choose which apps get to vibrate to send you notifications. You can pick one call source (probably your Contacts app) and one text source (SMS, WhatsApp, or Hangouts). 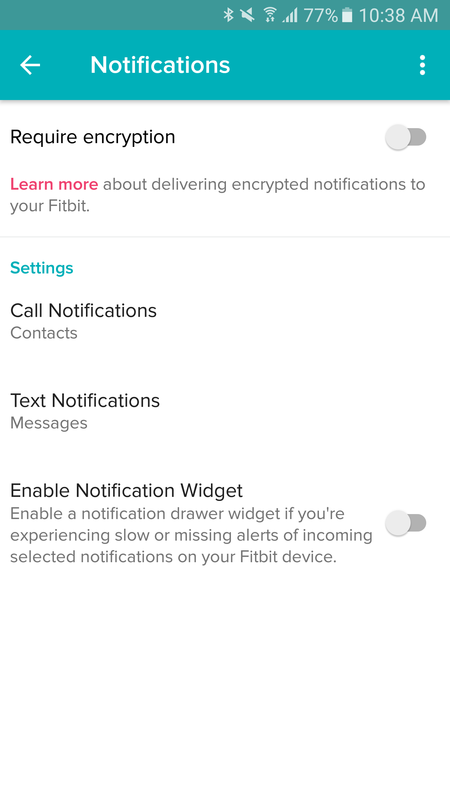 Without third-party app Fit Notifications, your choices are very limited. But then again, given that there's no full display here, just illuminated LEDs, there's no sense in getting more notifications since you can't tell what they are exactly. You differentiate between incoming calls, silent alarms, reminders to move, and text messages, by the color of the first LED and how many white LEDs are lit before it. The first couple of days, it's not very obvious, but you figure it out with time. For example, if I get a vibration and see a purple light, I check the time. It's surely 10 minutes before the end of the hour (10:50, 11:50, 12:50, etc...) and that's a reminder to move. 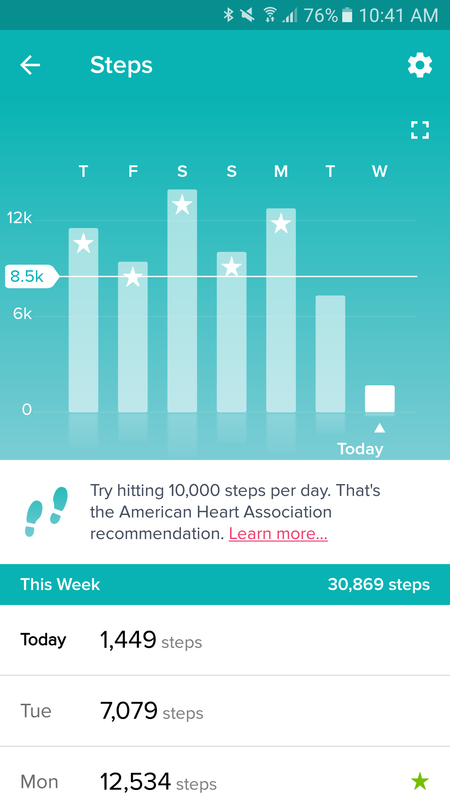 For the stat nerd, the Fitbit app offers a lot of graphs to view. 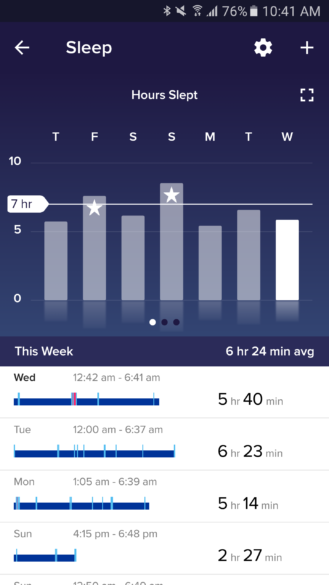 Steps, calories, distance, active minutes, and more are shown in daily, weekly, monthly, and yearly bar graphs, so you can see how well you're doing in general. Or not. 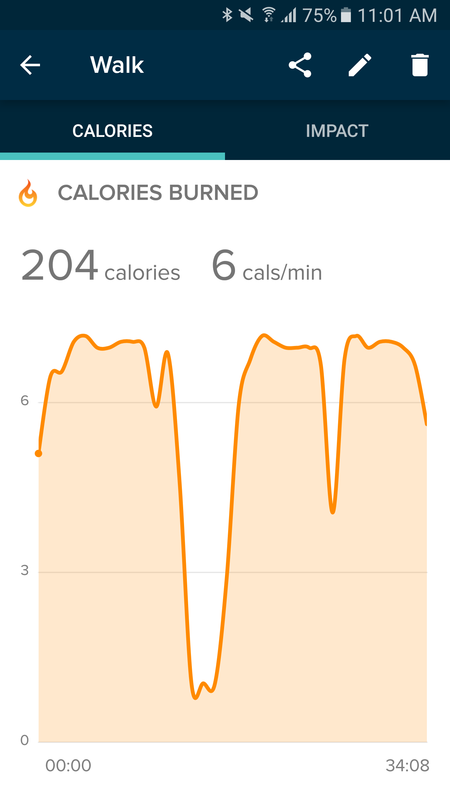 I don't look at the exact total of steps I take each day but at the ballpark numbers, so these different graphs help me a lot to gauge my activity level. That's even more true in this case because the Flex 2 doesn't come with a clip to be attached to pants or bras like the Fitbit One. See, I often walk with my hands relatively steady (in my pocket, holding a phone/tablet, etc), so the Flex 2 struggles to accurately count the steps because it's worn on my wrist. I know I'm missing a lot of steps because of this, so I've bought a cheap third-party magnetic clip from eBay, and until it's delivered to me, I'm just looking at the ballpark activity level. 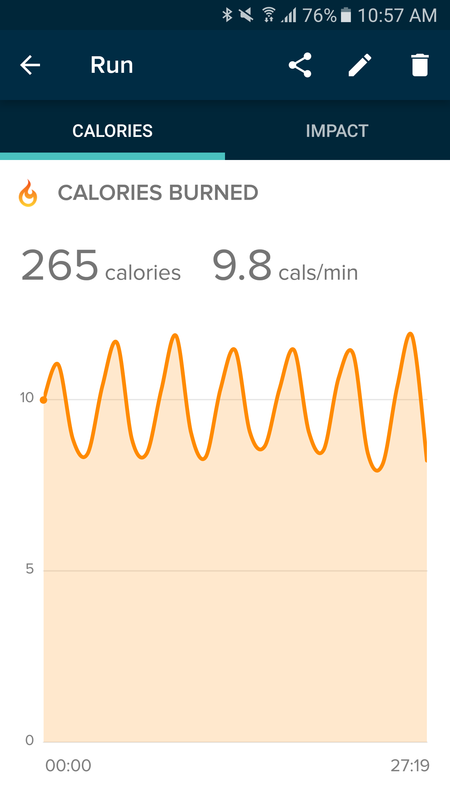 Sadly, the Flex 2 also doesn't have an altimeter so my floors stats for the past couple of weeks have been nil. 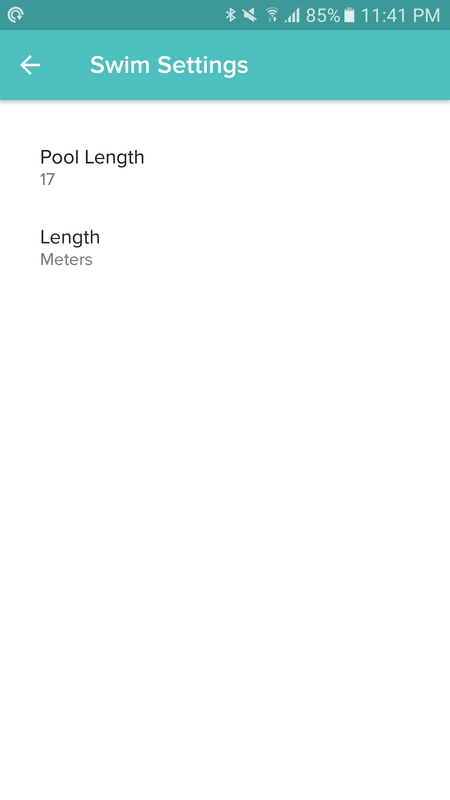 Why did the company prioritize size and weight over the inclusion of an altimeter, that's a question I can't answer unfortunately. It's sad that my 4 year-old One can track how many flights of stairs I climb but the new Flex 2 can't. 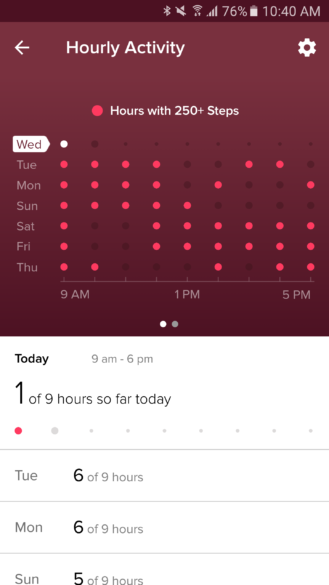 One of my favorite graphs with the new Fitbit trackers are the Hourly Activity ones. I love seeing how frequently I'm moving every day and how long I'm sitting for. The reminders to move help me improve those stats since they buzz to get me off the chair every hour. I spend most of my day glued in front of a computer screen, so these are as important as my morning walk/run/swim, because they motivate me to stay at least a little active and rest my eyes throughout the day. 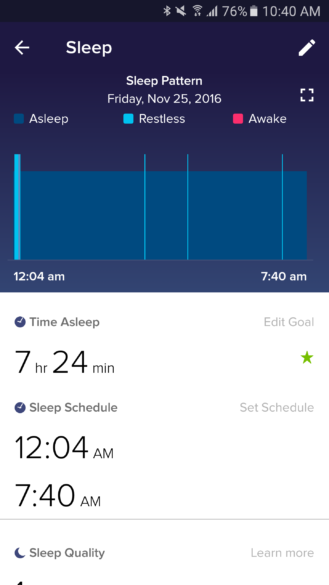 Like all of Fitbit's recent trackers, the Flex 2 has automatic sleep tracking, which also recognizes naps and broken up sleep patterns. My sleep hasn't been very regular over the past few months, so I'm glad that I don't have to manually log it every day and remember when I napped or dozed and for how long. The Flex 2 takes care of it. 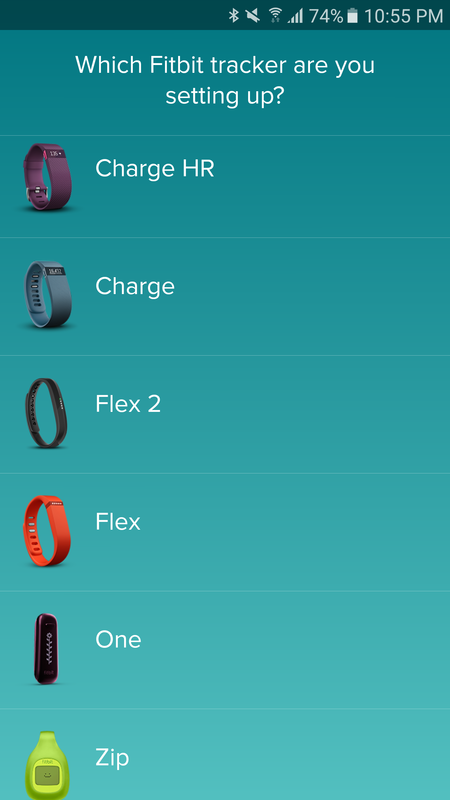 The Flex 2 also automatically recognizes exercises, just like the Blaze and Charge 2 that I've reviewed before. 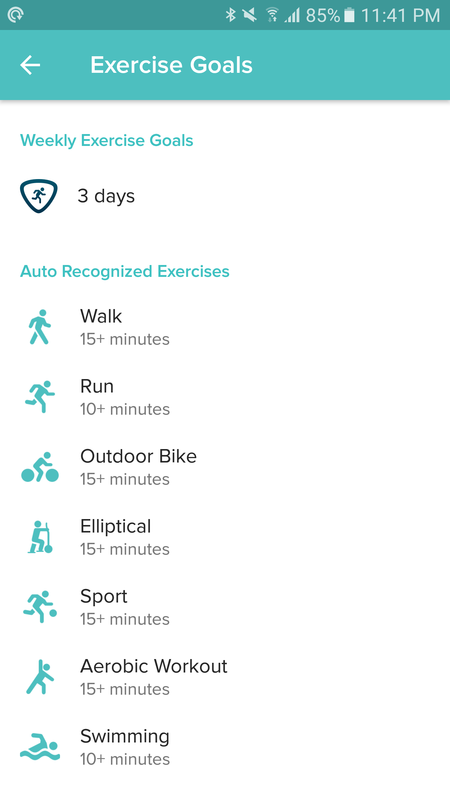 Not having to manually log a walk, run, bike ride, basketball match, or swimis so freeing. The Flex 2 just knows when I've been active and what type of exercise that is. 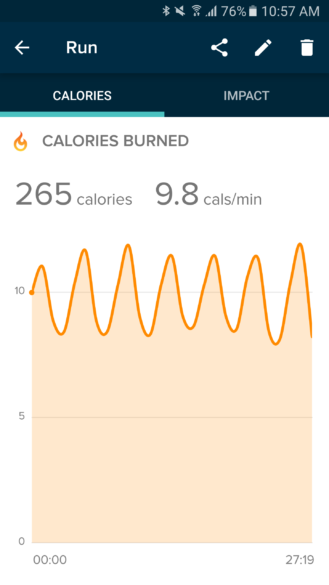 Sure, there's a bit of benefit in active tracking — namely using your phone's GPS to capture your route and improve the distance stats — but I have grown used to just relying on the Flex 2 to do its thing without any interference on my end. 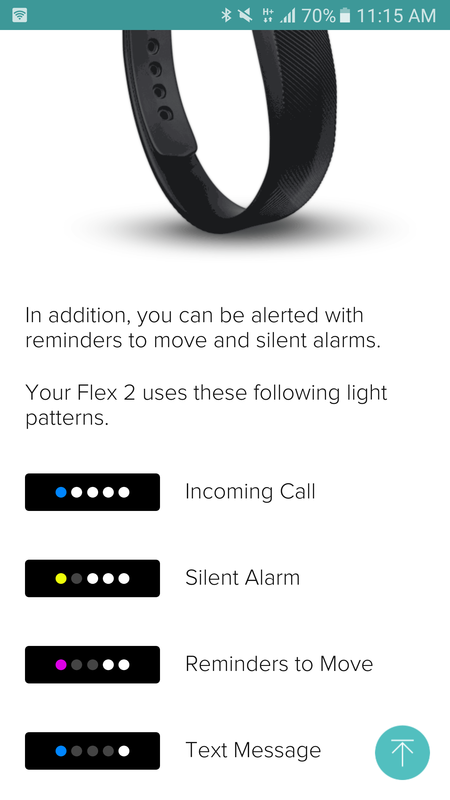 I can go for days without even touching the Flex 2 beside turning off the silent alarm and it makes sure my sleep, runs, walks, swims, are all logged to the minute. 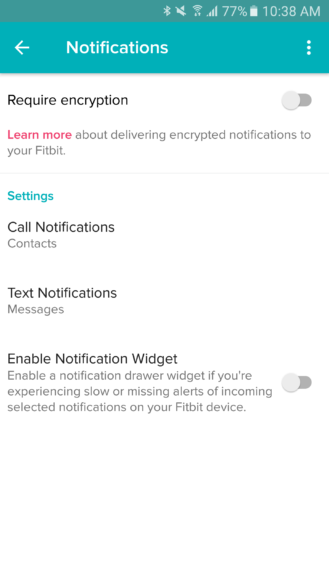 Before you jump into the pool and feel disappointed that the Flex 2 didn't track your swim, there are two settings you have to adjust in the Fitbit app. 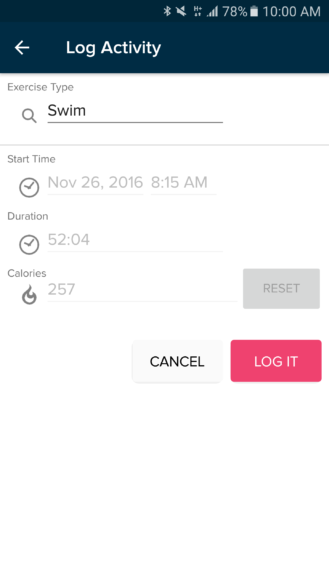 Under the Account settings, there's an Exercise Goals section. 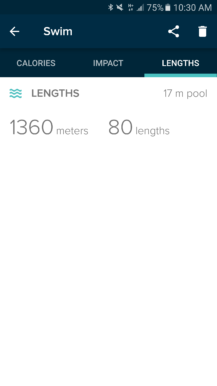 You will need to turn Swimming on and set it to recognize swims that are at least 10 minutes long (or more if that's what you prefer). 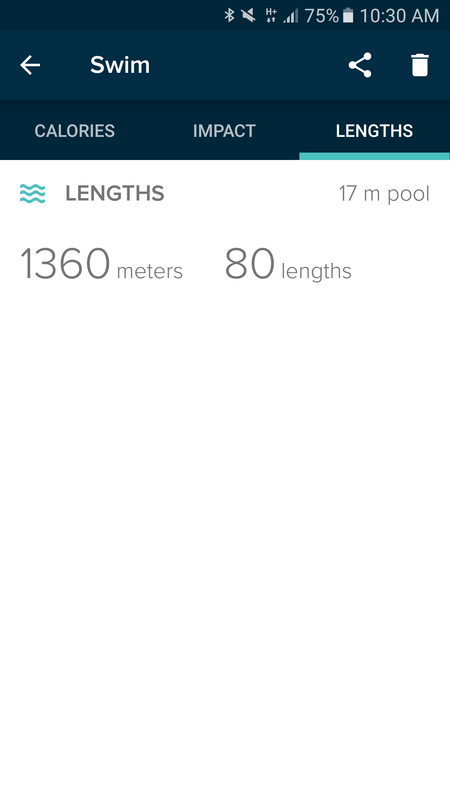 Then there's a separate Swim Settings section where you'll be able to set the pool's length and unit. 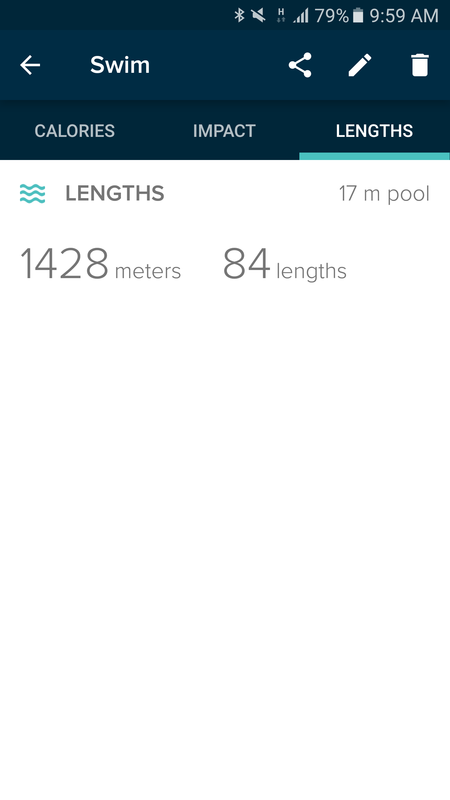 The indoor pool I swim at in the cold season is only 17 meters long, so I'm glad Fitbit can take lengths smaller than 25 meters. Once those settings are fixed, all you have to do is jump in the pool and swim then get out when you're done. 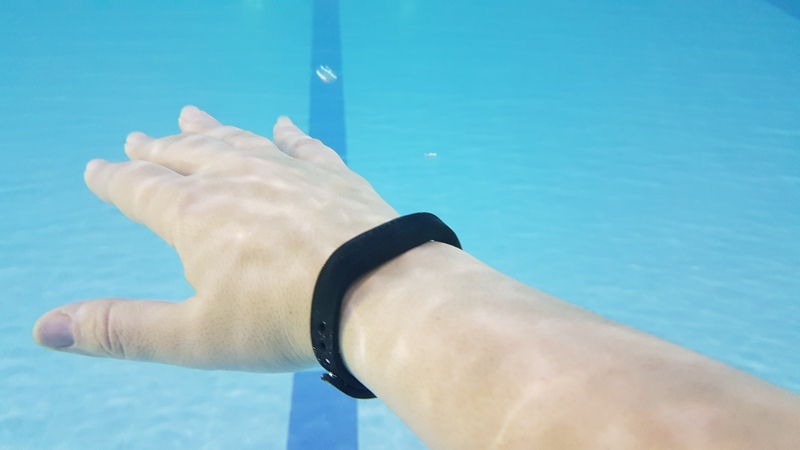 Amiigo required you start and end a swim from your phone, the Garmin vivoactive needs you to manually launch and stop a swim from the watch, and you have to triple tap the Misfit Shine 2 Swimmers Edition (SE) to start and end tracking a swim. The Flex 2 needs nothing. No buttons to press, no phone to bring with you. 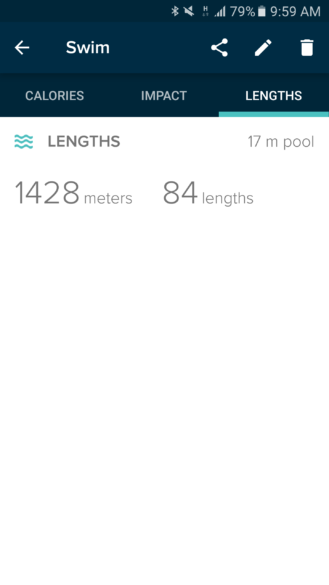 It's definitely one of the least involved swim trackers I've used over the past couple of years. That brings a bit of compromise with it though. 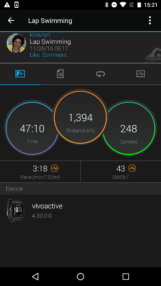 During the swim, you can't see your stats like Garmin's vivoactive allows and you also can't set a timer like the Shine 2 SE lets you to know when you've completed your swim. You have to work based on another watch you're wearing or the wall clock at your pool. And when the swim is done, you only get some limited stats. But we'll get to that in a bit. I've tested the Flex 2 several times in the pool. 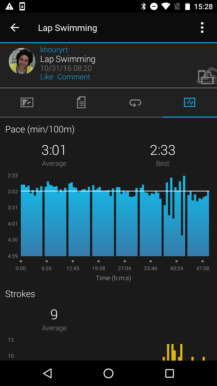 It never failed to automatically recognize a swim's start, and it accurately got the end most times. 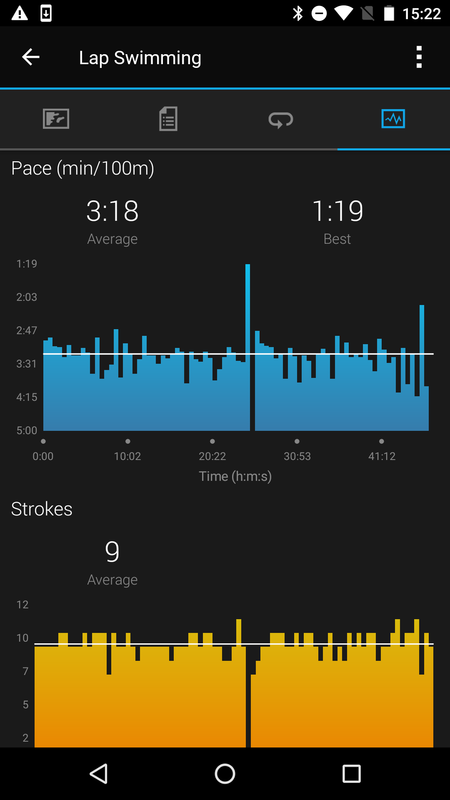 Only once in my first try I noticed that the Flex 2 kept the swim going way after I was done and had showered and was out of the gym: it added a lap for no reason there. That hasn't happened again, so I'm filing it as a fluke. I tried freestyle swimming with underwater flips at the wall and regular flips by reaching the wall and turning around. 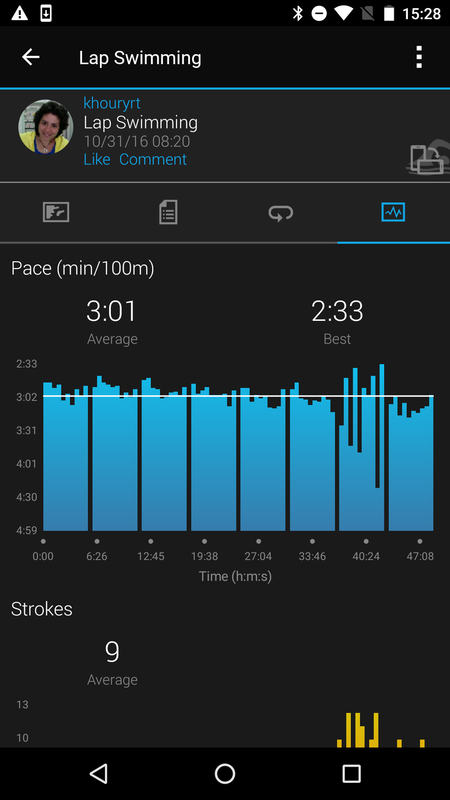 I also tried the breaststroke and backstroke, sometimes even alternating the style between laps or at the wall after one length. 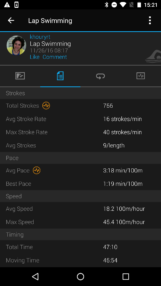 The Flex 2 recognizes all my pool lengths and laps accurately, regardless of the swimming style. It's been even more reliable than the Garmin vivoactive, which sometimes has a tendency to skip a flip and count an entire lap as one length. 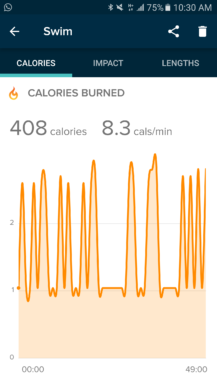 It's also more reliable because of its automatic nature: I manually log intervals with my vivoactive and every now and then, I forget to tap the button to start an interval, causing me to miss a few laps until I realize the screen is still in paused mode. 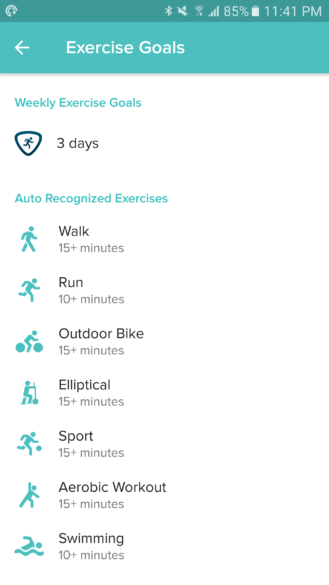 The main exercise list shows your swim next to your walks, runs, and other activities. This is where you can quickly see the starting date and time, duration, calories, swim distance, and average pace (including all your pauses, gah!). Tap on it and you reveal a few more stats. 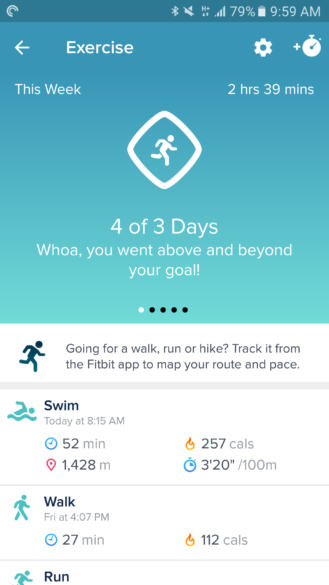 Fitbit uses calories as the main graph unit, not pool lengths, pace, or speed, and that doesn't make a lot of sense for swimmers. 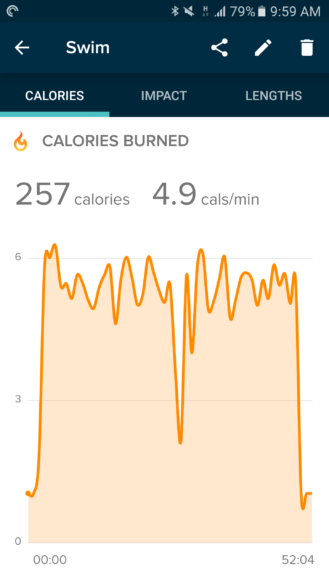 I get that the calorie expenditure is directly correlated to how fast I'm going, but I don't know what to do with that number. 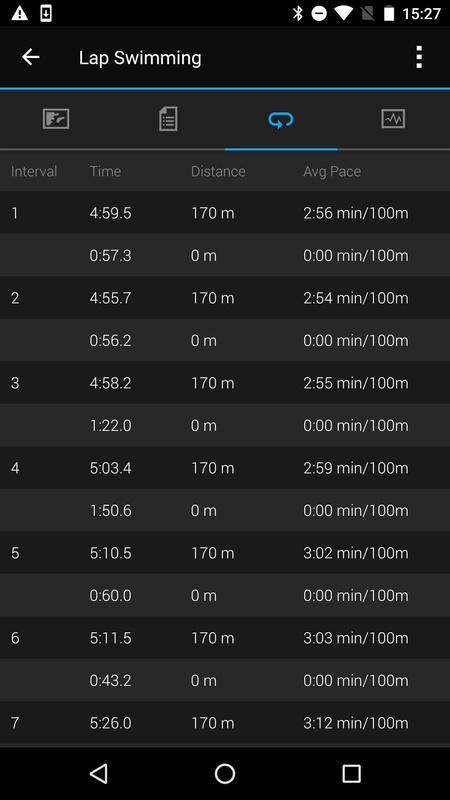 4.9 calories per minute is gibberish to me, but a 2:58min/100m pace, that is a number I understand. 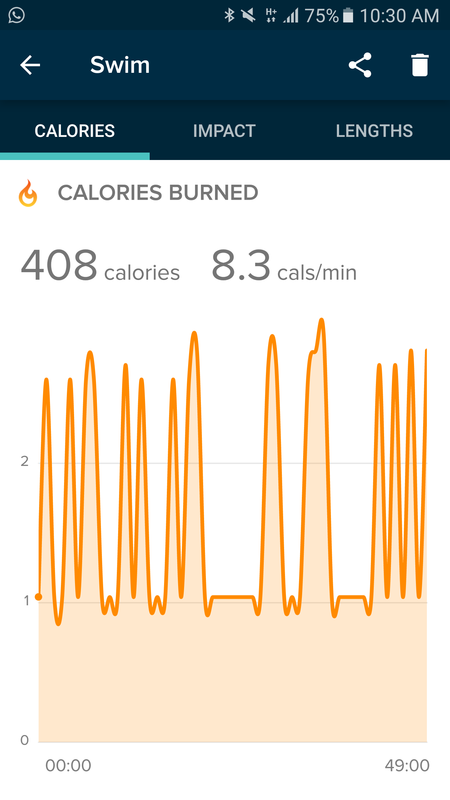 Beside the calorie graph, you can see the impact of the swim on your day, the final stats for the total distance and the number of pool lengths you swam, along with an Edit pencil icon to modify the exercise type in case Fitbit mistakenly recognized something as a swim. 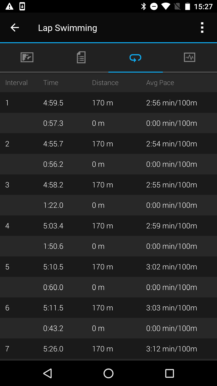 As a comparison, this is what the Garmin vivoactive shows me for the same swim as above. 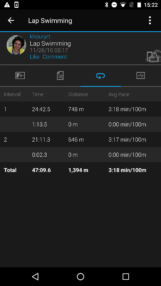 Check those pretty stroke, pace, speed, and timing stats, those separate intervals, and all those graphs for pace and strokes. 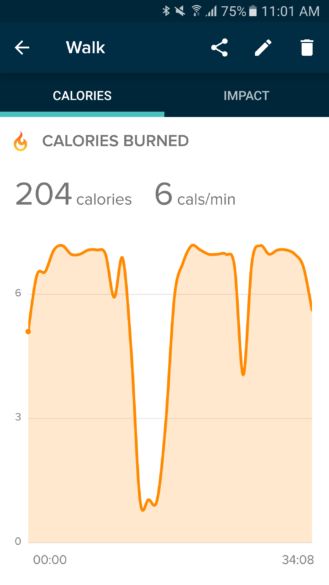 Note: the sudden fall in calorie expenditure on the Fitbit graph above corresponds to the break I took between intervals as shows in the Garmin stats below. 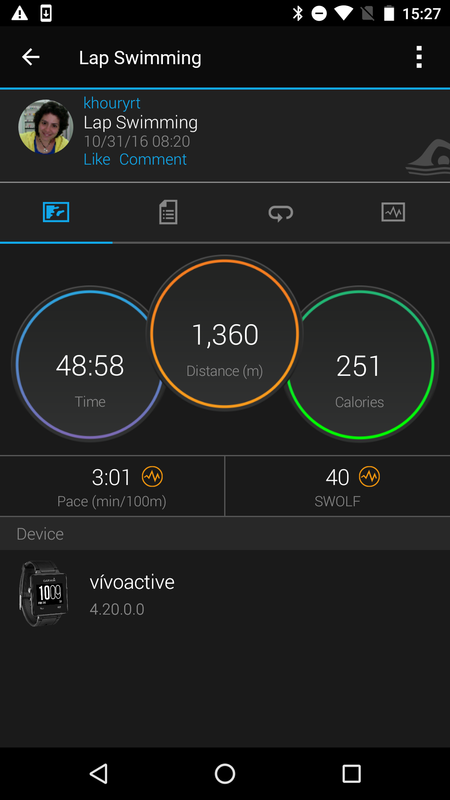 Fitbit Flex 2 (above) and Garmin vivoactive (below) stats for the same swim. I'm sure Fitbit can implement these stats without a lot of effort. 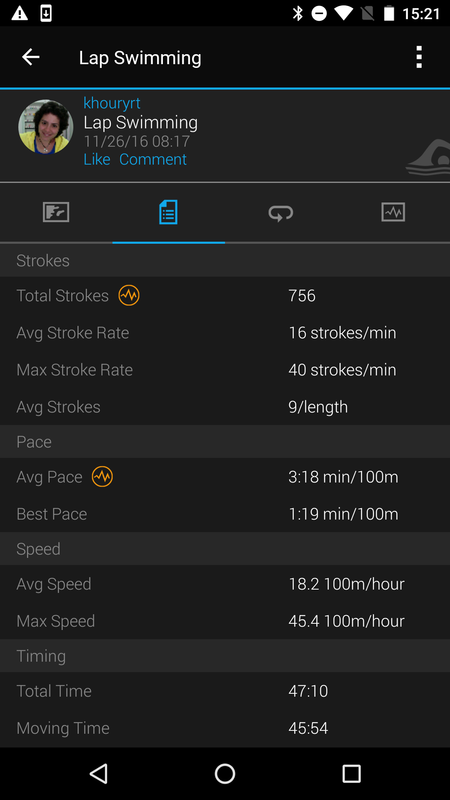 Since it's accurately tracking the entire swim's duration and distance, and it knows exactly how many lengths I've swam, and the calorie graph clearly shows that it knows when I've been active and when I'm resting, it shouldn't be too difficult to show detailed stroke, pace, and speed stats, and even smartly divide the swim by intervals. 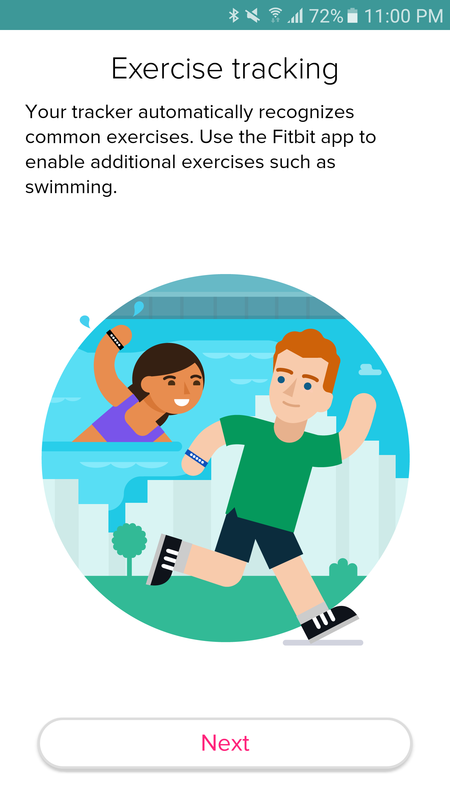 That'd be fantastic and aside from the lack of a screen and in-swim stats, it'd put the Flex 2 at the top of my swim trackers. 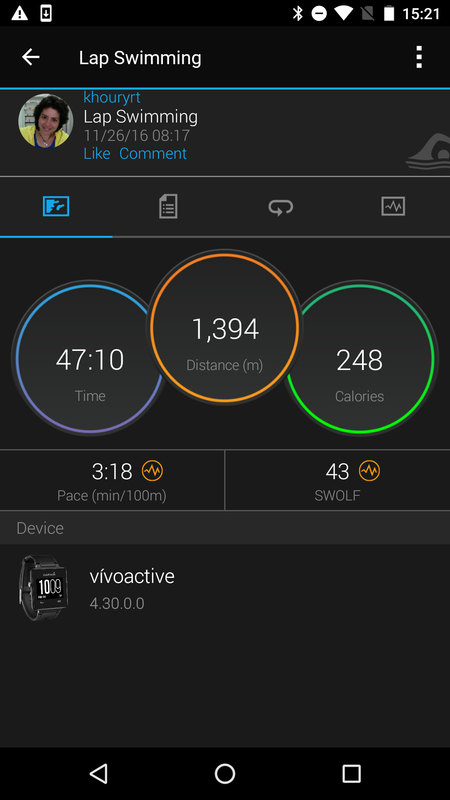 As it stands, the Flex 2 is a lot less useful than the vivoactive as a swim tracker, but it does show a little more promise and stats than the Misfit Shine 2 SE. 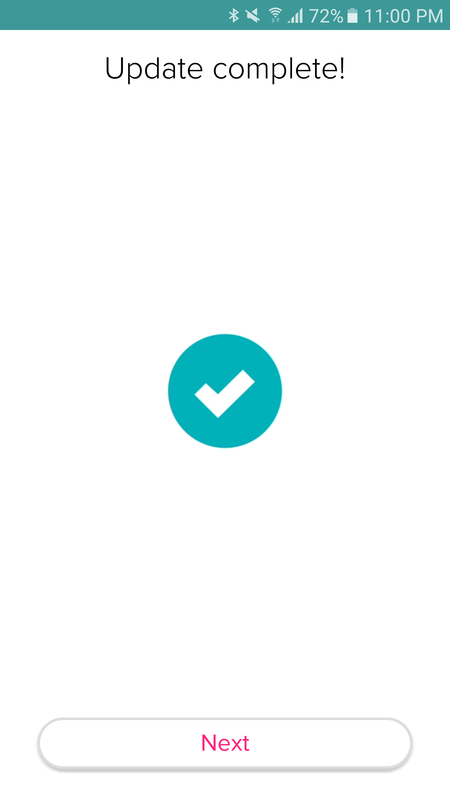 However, it trumps both on the seamless tracking front. Not having to press or tap anything is perfect for forgetful types like me and those who just want to swim without fiddling with technology. As a follow-up to the original Flex, the Flex 2 is an impressive improvement. 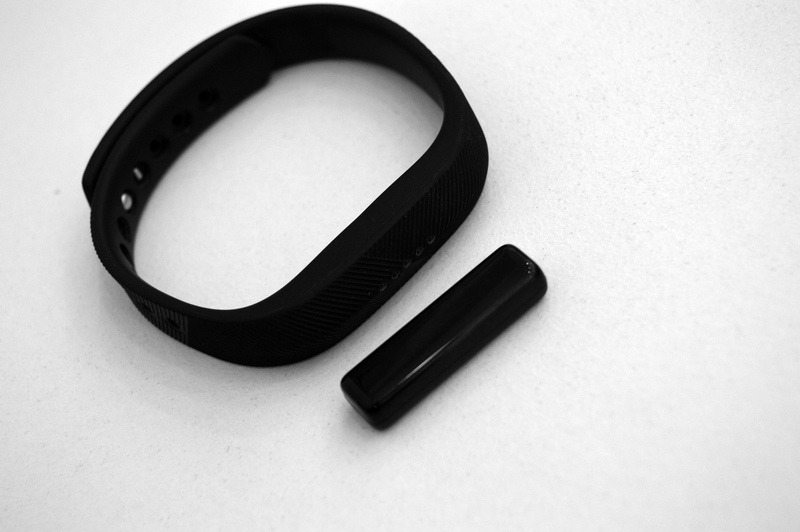 Not only is the band better built and the clasp mechanism a lot more reliable (almost infallible really), it's also smaller, lighter, and more capable thanks to automatic exercise recognition. 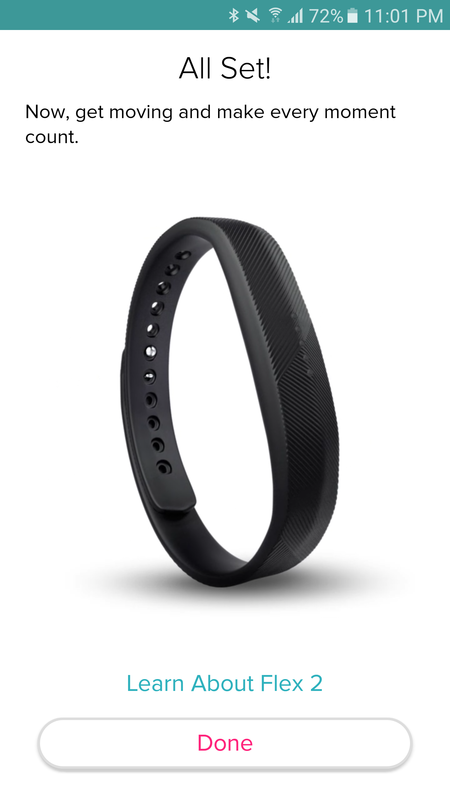 The Flex 2 is easily one of the most "forgettable" Fitbit trackers, and I say that in a positive note. You won't notice wearing it, you don't have to remember taking it off in the shower or pool, and you don't need to fiddle with it for anything. 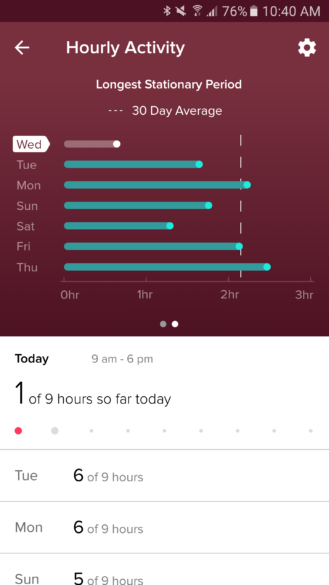 Sleep, naps, steps, distance, calories, exercises, swims, hourly activity, everything is tracked without any intervention on your side. It even buzzes to entice you to move when you've been sitting way too long. Thanks to water-resistance, this is the first Fitbit you can take in the pool. 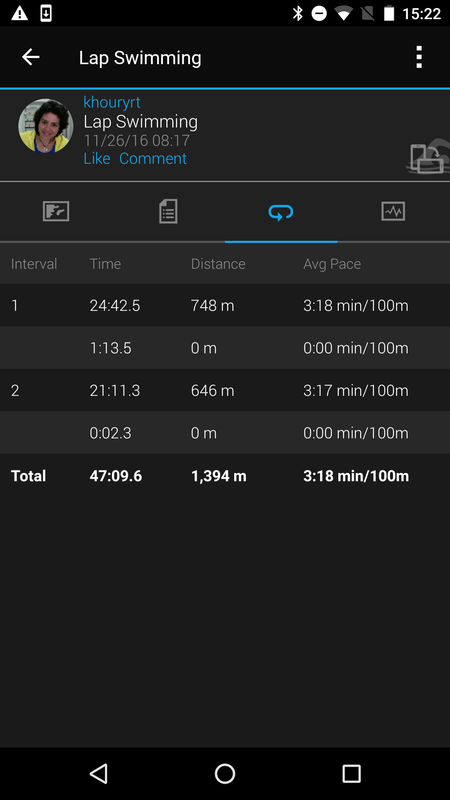 The swim stats are very basic if you're used to Garmin's more detailed intervals, pace, and stroke graphs, but they are accurate and they do the job if all you need is a total duration, pace, and distance, as well as the calories expended and minutes spent to count toward your day's goal. Yet, there are two major compromises to be made if you're interested in the Flex 2: no floor tracking because of the missing altimeter, and no display for any clock, exact step count, or notification features. Oh and there's no heart rate sensor, but then again, given the size, that's quite expected. At an MSRP of $99.95, the Flex 2 is a little on the expensive side. If you don't really need the swim tracking, the Alta is a better option with its MSRP of $129.95. It's a little larger, but it accommodates a display for the clock, exact daily stats, and notifications. 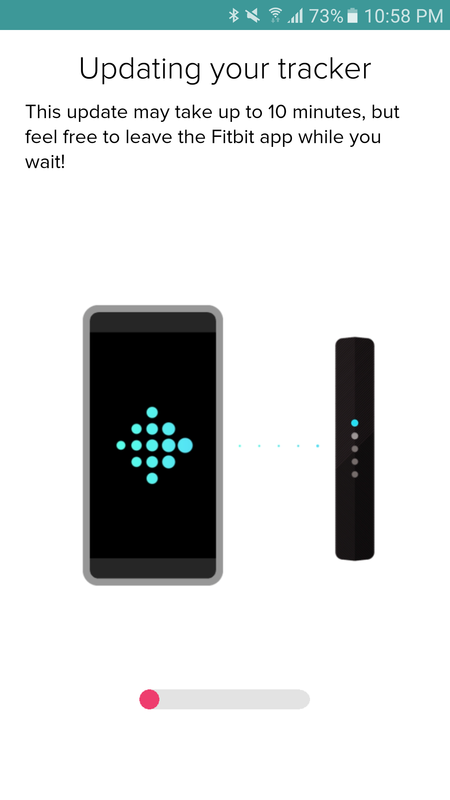 The Fitbit One might also be worth considering, because of the altimeter and display, especially if you can find it at a lower price than the MSRP. 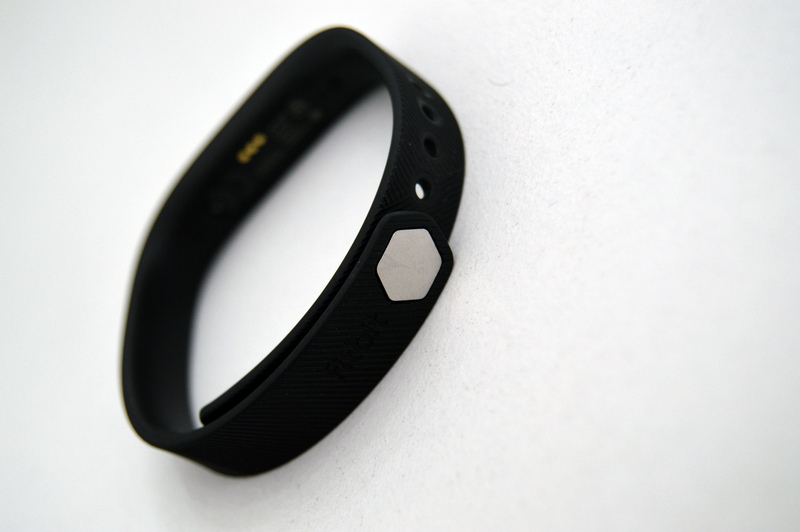 It doesn't have any smarts though, so you'll have to manually log sleep, naps, and exercises. Compromises. If you happened to catch the Flex 2 at $69 or even $59 on Black Friday, that was a killer deal. I hope the price drops to around $79 frequently, because that's the threshold where I'd say it's worth buying, even just as a complement to an existing Charge 2 or Blaze or Surge. As for me, I'll keep waiting until Fitbit releases something like the Charge 2, but in the size of the Alta and with the water-resistance of the Flex 2. One can dream, ok?